Hong Kong Soya Sauce Chicken Rice and Noodle (Chinese: 香港油雞飯·面) is a street food stall in Outram, Singapore. It is owned and run by Chan Hon Meng. In 2016, it became one of the first two street food locations in the world to be awarded a star in the Michelin Guide. Hong Kong Soya Sauce Chicken Rice and Noodle is a street food stall, one of over 6,000 such stalls within Singapore. It is owned and run by Chan Hon Meng, and has a signature dish of soy sauce chicken served with rice. On average it sells around 150 lunch chicken dishes each day; as of 2016, these dishes were priced at S$2. It is staffed by Chan and his two assistants. 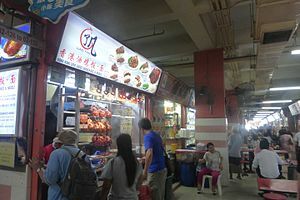 The stall itself is fairly typical for those in Singaporean hawker centres, featuring a neon sign and rows of hanging cooked chickens. Hong Kong Soya Sauce Chicken Rice and Noodle became one of the first two street food stalls in the world to be awarded a Michelin Star, alongside Hill Street Tai Hwa Pork Noodle, gaining the recognition in the 2016 list for Singapore. This was the first time that Singapore had a Michelin Guide created for it. Chan hoped that the award would result in more young people entering similar businesses, as he has concerns about stalls being run by elderly chefs with no successors to inherit them. Following the announcement of the Michelin Star, the queues at the food stall have increased in length and a two-hour wait is not uncommon. Sales have also increased, from the previous average of 150 dishes per lunchtime to around 180. Chan said that he would not increase the prices of his dishes, saying "it’s not fair to raise them just because I won an award, in fact, my suppliers have increased prices four times in the last seven years and I’ve not changed my prices at all. I will continue trying to absorb the price increases until I really can’t do it." ^ a b c Kim, Soo (July 25, 2016). "Singapore street food stalls get Michelin stars". The Daily Telegraph. Retrieved August 8, 2016. ^ a b Han, Kirsten (August 4, 2016). "Michelin star for Singapore noodle stall where lunch is half the price of a Big Mac". The Guardian. Retrieved August 8, 2016. ^ a b Tay, Therese (August 8, 2016). "Michelin star a double-edged sword for hawkers". Today. Retrieved August 8, 2016.